No Fat Birthdays' mission is to set a standard in group personal training. We strive to provide an atmosphere that is positive, motivating; yet pushes you a little further every time. Success in fitness comes from changing the routine, adding progressive active and structure. Each member of our team is driven to help you to help yourself be even more awesome. With a little bit of your time coupled with a serious effort on your part, nearly anything human is possible. Derived from an odd thought in 2011, No Fat Birthdays is simply a mission statement to live by. We believe all people should strive to never ever be fat on their birthdays. Of the many "things" we do, allowing the space for others to actively pursue their individual greatness is among the most important. We care very much about the mental, emotional, and physical health of the human being, PERIOD. Our passion to help others help themselves set us apart from any other person, place or thing in the fitness, health & wellness business today. No Fat Birthdays is family-owned and operated in Northeastern Ohio. Located in the Washington Square Shopping Center on the second floor: 28080 Chardon Road, #207, Willoughby Hills. OH 44092. You will find the studio very inviting. Working with Jamey Mixson and his awesome team of committed and passionate fitness professionals you will find that blowing your fitness goals out of the water isn't as hard as you thought. We believe that giving a lil bit of time and alot of effort pays off. I was the kid on a skateboard, BMX bike, running, racing, jumping - just having a blast. I've carried that energy and thirst into my adult years (Darn it! I'm an adult). I embraced sports as a child as my family put me in a position not only to play but thrive and win. My goal is to share that same thirst with others. I'm a son, brother, husband, dad, and friend to thousands. 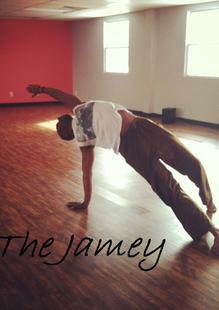 Jamey is a Certified Personal Trainer, a yogi and sneaker head. He is certified in a number of group fitness formats including R.I.P.P.E.D. He moved from LA to Ohio with his new wife a few years ago. He immediately found a need for a serious fitness facility not offering the same rehash of 80's aerobics class. Fitness has grown a great deal yet many instructors refuse to grow. Continuing their education/life as students of fitness to offer the highest level of quality to their clients - Jamey does that. You will find him nose deep in the latest copy of almost any fitness magazine, journal, best-selling book, simply to stay abreast of the markets. Jamey also jumps at the opportunity to take as many classes as possible. A good student is a good instructor. Jamey opened No Fat Birthdays to take the local fitness community to the next level. His training methods are functional, effective and efficient and he thinks nothing is better than leaving a training session dripping in sweat and feeling awesome! Be prepared for a lot of high intensity interval training (KICKASS) when working out with Jamey. He ignites a fire to energize, inspire, and push clients to continually be their best. Prior to NFB JAMEY taught packed group classes at several top group fitness gyms in the Cleveland Eastern Suburbs. Jamey has trained clients of all different fitness levels and has taught a variety of group fitness classes over the years with a focus on endurance, power, conditioning, dance fitness and yoga. Jamey is passionate about helping "every" client reach their health & fitness goals and teach them that it's more than just training, it is a lifestyle. As an NFB Rockstar you will have an amazing friendly and out going personality, the ability to engage clients with no regard for limits, expectations, and fears. You should also have a killer social media presence. When you post the moon should shake...Positive Hype! Rule #1 for instructors: "KICKASS"